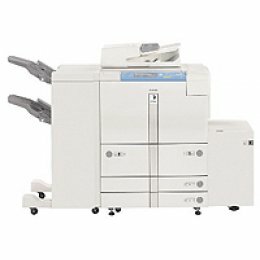 The imageRUNNER 7200 comes standard as a 72 page-per-minute digital copier with a total programmable copy set capacity of 9,999. A standard 100-sheet automatic document feeder can handle paper sizes from statement to ledger. In addition, the imageRUNNER 7200 features a standard 4,150-sheet paper supply, upgradeable to 7,650 sheets, and can handle a variety of paper sizes and types in weights from 17 lb. Bond to 110 lb. Index. Automatic paper tray switching and on-the-fly paper reloading further enhance productivity. The imageRUNNER 7200, like all Canon networked office systems, ships with a comprehensive set of tools designed to simplify device installation and network management for both end users and administrators. With the imageRUNNER 7200, you CAN have it all - faster, easier, and more affordable than you ever imagined.